A champion bare-knuckle fighter has appealed for information on the whereabouts of an Aberdeen teenager who has now been missing for more than two months. Liam Smith was last seen boarding a bus in the city on Saturday, November 17, and it is believed he got off in the Deeside area. Huge search efforts have been carried out in an effort to track down the missing 16-year-old but no trace of him has been found and his subsequent movements remain a mystery. 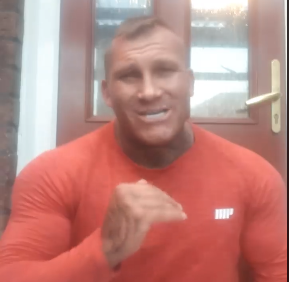 UK bare-knuckle fighting champion, Decca Heggie, yesterday appealed for information on the teenager’s disappearance via a video he published online. Mr Heggie, who is also a body-builder, appealed directly to Liam as he asked for him to come home – and pledged to visit Aberdeen for a “training session” if he did so. The musclebound 35-year-old said: “Liam, if you get to see this video, come back home. “Come back to your family mate, where you are loved and wanted, and we will make you a deal. Liam left his home on Aberdeen’s Queens Road at around noon on the day he went missing. He was spotted on CCTV around half-an-hour later at McDonald’s on Union Street and he has been tracked thereafter to the Sainsbury’s store on the corner of Guild Street and Carmelite Street. Liam is described as being 6ft 4in, of a slim build and short brown hair. He is known to walk with a distinctive gait. When last seen he was carrying a camouflage North Face rucksack and wearing Nike Air Max trainers. Police searches are continuing in the Crathes area.